We have a full complement of communications equipment, though I’ve drawn the line at satellite broadband because I feel the airtime is still too expensive. Here’s the lineup. The primary VHF is an ICOM M604 mounted at the nav station. There are also two remote microphones, one under the hard dodger with the Furuno multi-function display and a second at the starboard wheel. The M604 is connected to a GPS and can send out a DSC distress call with our position if necessary. In addition, we have three handheld VHF radios. An Icom M34 is in the ditch bag and we recharge it every two months. We keep an ICOM M88 in the dinghy should a problem arise, and for use ashore to call back to the boat. The third is a Standard Horizon HX850S. I got the HX850S for the built in GPS and DSC capability. However, the battery life is only about 10 hours when the GPS is on, and it’s quite a large and bulky radio. We take it in the dinghy when we think the DSC or GPS capability might be handy, but it’s the least popular of the VHF radios. An ICOM M802 SSB is mounted at the nav station, but it has effectively been supplanted by the Iridium phone for email and weather. The primary use of the SSB is for cruiser networks and voice communication that can’t done any other way. Connected to the SSB is an SCS PTC-IIusb pactor modem for email and data. This is our primary communication tool when on passage or in an anchorage without WiFi. It’s essentially a 9,600baud connection to the internet - very slow - think 1981 dial up. But it works everywhere and is very reliable. We use it for email, weather and voice. We spent a little extra on the monthly service to have a phone number in the US which calls through to the Iridium phone. This allows our children to make a free call and connect to us wherever we are. The handset is mounted in a dock at the nav station and wired to an external antenna on the radar post. In the ditch bag we keep a spare battery and the removable antenna. If we’re forced to abandon ship, we’ll grab the phone out of the dock and have communications from our life raft. 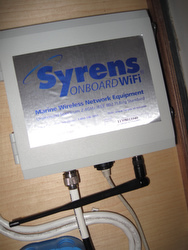 A Syrens MPAP-5000 is our WiFi link. It’s a WiFi bridge with two radios. The first radio is for the connection to an access point on shore and transmits at the maximum allowable 1 watt (30dBm) of power. The second radio is the access point for the onboard computers. This has three nice advantages. First, the onboard computers don’t need to worry about the current WiFi connection, we always connect to the same access point on the boat. Second, we’re able to share the connection to the access point onshore which is particularly handy when it’s a “pay for use” access point that would otherwise be limited to a single computer. Third, it establishes a local network which we can use for local file transfers and file sharing. This last item is handy when the connection is weak and we’re using the XGate SMTP server. One computer runs XGate and the other computers can send their mail via that computer and be assured that the mail will get through. Our first season we bought pre-paid SIMs each time we got to a new country, but that got old very fast. It was a hassle to select a local company, find the store, buy a SIM, buy some time, and then inevitably leave some time on the account which we’d never use again. But perhaps the worst problem was that our phone number was always changing so our kids were always confused about our “current” cell phone number. The only good part was that it was a local number and more convenient for local vendors. In 2009 we switched to a “call back” SIM from Telna Mobile. It’s a US based call back service with very reasonable roaming rates in most of the world. We have one US number no matter where we are so it’s like roaming with our home cell phone, except the airtime charges are a fraction of what AT&T charges. Incoming calls are simple, the phone rings and we answer. Outgoing calls took a little getting used to. You place the call, then the phone rings and a voice says that you’re being connected and then your call goes through like usual. The big advantage is just one number worldwide with very reasonable rates. The downside is that locals need to call a US number. But the majority of our calls are with friends and family in the US so it works well for us. The ACR Global Fix Emergency Position Indicating Radio Beacon (EPIRB) is the ultimate way to reach rescue resources. When all else fails, the EPIRB will get through to let someone know that we’ve got a serious problem.